At Faith Works Automotive we want to put an end to the guessing games many brake shops play with your repair. Let one of our A.S.E. 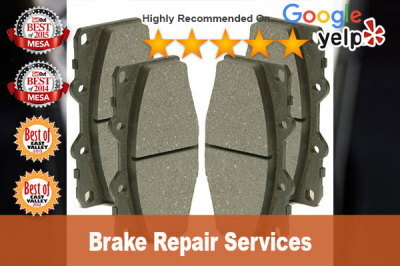 Certified technicians perform a thorough inspection of your vehicles brake system. We will provide you with a written estimate and take the time to answer any questions or concerns you may have in plain and simple terms. We are a brake service team, and offer many years of experience with all types of brake service. From basic brake pad replacement, to rotor service and turning, to major brake repair, we’re the trusted source when it comes to Mesa brake work.